Who's Got the Best Dressed Window in Acton? 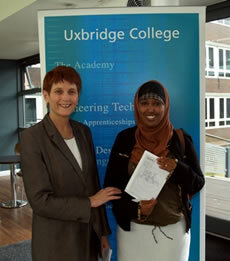 Laraine Smith, Principal of Uxbridge College, has been awarded the OBE for services to Further Education. Ms Smith joined the world of education more than 20 years ago because she wanted to make a difference. She is now Principal of Uxbridge College where she is dedicated to ensuring her staff provide the 10,000 full-time and part-time students with the best possible educational experience. Laraine grew up in Sydney, Australia, and started her teaching career working in comprehensive high schools. A move to London followed and after a year teaching at Villiers High School in Southall, she moved into further education in 1985, to concentrate on teaching adults and young people age 14-19 years. She has worked in four further education college and has moved from teaching to management roles, joining Uxbridge College in 2003 as Vice Principal for Curriculm and Standards. She studied at Sydney University and the Institute of Education, London University. In her spare time, she keeps fit by swimming and walking. She is married with two teenage sons.